Infinite Variety’s In Their Footsteps presents an informative account of the feminine experience during service in the Vietnam War. 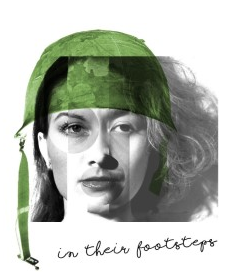 Given IV Productions’ focus on historical entertainment and educating their viewers on the consistently underplayed female story of some of our planet’s bloody courses, In Their Footsteps is an understandable choice for IVP’s 2018 Fringe Production. The production aims to share the story of five female veterans, giving a personal air to what otherwise might have been a dry, historical account. The issue with covering so many perspectives in one sitting, however, is clarity of focus. Fringe Venues have short slots, ranging from around an hour to perhaps two, at the longest. Due to the brevity of the piece, In Their Footsteps (unintentionally) glossed over some of the more poignant elements of its central quintet. War, as we well know, is hellish— this becomes difficult to convey with full emotional efficacy when tackled from five sides, at a rapid pace, in staggered anecdotes. Moreover, weight of focus seemed a touch off; by the play’s conclusion, IVP had only briefly touched on some of the more deeply interesting after-effects of the Vietnam war on late 20th century women, such as the psychological displacement of female veterans, social ostracization, guilt and the true impact of Agent Orange. Had the piece had more time, an exploration of these issues would have struck a well-needed balance with the earlier sections of the piece, which focussed largely on American Exceptionalism, Patriotism, fear of the enemy and the experience of male soldiers. What must be commended, however, is IVP’s commitment to accuracy and research. Having spoken directly with five female veterans (one of whom we later learned was actually in the audience,) In Their Footsteps draws on real historical data, adding emotional weight and shedding light on stories that otherwise would not have immediately come to mind when prompted by the phrase “Vietnam War.” IVP’s use of sound, both electronically generated and vocal in nature, was particularly effective at building tangible scenes in quick succession. Moreover, the set work remained fluid and imaginative, extracting as many possible set-ups from what was ultimately a black-box theatre. The work that Infinite Variety Productions are doing is indisputably important, and their outreach efforts are impressive to say the least. All these NYC natives need now is either a longer run-time, or a tighter focus; in order to truly do justice to the emotional and personal journeys of the women who form its character basis, a narrower lens is needed, to provide both clarity of narrative and of emotional beats.